This is the first thing you should know—the chemicals found in liquid drain cleaners are usually only formulated to dissolve some, but not all, of common sources of drain clogs. For example, most are good at dissolving hair. But grease, grime, and even soap scum can build up despite your best attempts with drain cleaner. Some of the particles that liquid drain cleaners cannot dissolve might get pushed farther along in the drain line. This is one of the ways you can end up with clogs deep along in the sewer line that require professional tools and equipment to remove anyway. Any leftover greasy residue gets pushed down so that additional debris can collect and form a large blockage. Aside from the fact that they might not resolve your drain clogging issues anyway, chemical drain cleaners have other side effects, too. First off, they’re extremely toxic to both humans and pets. They can cause injury to the skin and eyes (which is why you should absolutely keep them out of reach of little ones). Secondly, they can actually cause damage to the lining of your drain pipes. We’ve seen this firsthand—this means potentially premature replacement of your drain pipes, something you definitely want to avoid. What if you want to clean your drains, but not necessarily to get rid of a clog? 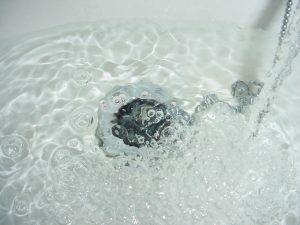 Kitchen sink drains and even bathtub drains can get smelly after a while. We still discourage you from using store-bought drain cleaners, but there is a DIY hack you can try. Add ½ cup baking soda to your drains, and follow that up with a cup of white vinegar. Wait about 15-30 minutes, then wash it all down—carefully—with a pot of boiling water. This may just do the trick. For the toughest of drain blockages, liquid “cleaners” and chemicals simply won’t do. You may instead need a high-pressure hose to clear out the drains, which is known as hydro-jetting. Hydro-jets use an omnidirectional head with an extremely high powered stream of water to scour your drains. You should really only trust the pros for this job as they will be more experienced, and there is less of a chance of pipe damage—or worse, injury. When you need a professional plumber in Maryland Heights, MO, look no further than Performance Plumbing. Contact us today!